Christianity does not and cannot validate and normalise racism, bigotry, anti-Semitism, sexism, xenophobia, homophobia, even when some in the past and now who claim to be Christians have historically used the Christian faith and its institutions to entrench slavery, bigotry and racism in the United states of America. “I do not see how Donald Trump is biblically qualified to serve in the office of the Presidency. I believe voting for Trump would bring dishonour to God. Since I cannot in good conscience vote for Donald Trump and yet have sinfully made a pledge that I would, the best option I see at this time is to resign my position as an Elector”. – Art Sisneros, Republican Party Elector From Texas. Christians continue to engage the significance of the outcome of the November 8 election in America for one reason. True religious faith (not faith as “conservatism”, for religious faith is not synonymous with conservatism) is the only remaining safe haven and sanctuary against racism, bigotry, xenophobia, sexism, homophobia and anti-Semitism. As we have seen in the November 8 elections – under Donald Trump’s dangerous, bigoted and racist platform – in a situation where the working and middle classes of a particular race see working and middle classes of another race as the enemy, class and political parties, class solidarity, etc can not be taken for granted as safe havens and sanctuaries against racism, bigotry, division as promoted by Donald Trump. Even American Christianity collapsed under Donald Trump’s extremely dangerous political platform when 52 percent Catholics and 88 percent evangelicals voted for racism and bigotry. This is why true faith and religious experience, as espoused in 1 John 5: 12, 1 John 4: 20, and John 17: 21, and as being re-articulated and defended by Pope Francis, is the only safe haven and sanctuary left standing. Here, I am talking about true religious faith, the Christian faith, true religious experience and values against the background of 1 John 5: 12, 1 John 4: 20, and John 17: 21, and not “conservatism” or the so-called “conservative” values, which have been falsely associated with and dubiously equated with true Christian values and genuine spiritual and religious experience. Conservatism – political or religious – is an ideology; it is not Christianity or true religious values and spirituality. Conservatism and conservative values – religious and political – validate and normalise racism, bigotry, sexism, xenophobia, and homophobia, and anti-Semitism. Christianity does not and cannot validate and normalise racism, bigotry, anti-Semitism, sexism, xenophobia, homophobia, even when some in the past and now who claim to be Christians have historically used the Christian faith and its institutions to entrench slavery, bigotry and racism in the United states of America. It is in this context that we see how it is natural and normal, as it happened in the November 8 election in America, for race supremacist groups such as the KKK, the alt right, their media – Fox News and Breitbart News, and other racist groups to support Donald Trump. However, the strange force in this alliance that voted for Donald Trump, which has surprised so many people given Trump’s (an extremely profane candidate) own ridiculously un-Christian values, is a section of the American Church that falsely equates their conservative views with true Christianity and true Christian religious values and experience. This is why it is important from this moment on to protect and defend the bible, the only word of God (and not someone’s “conservative” views), against racism, bigotry, xenophobia, homophobia, sexism and anti-Semitism that are being mainstreamed following the November 8 election and that are being promoted by the alliance (which included a section of the American Church) that voted for Donald Trump. That Trump’s campaign was built on racism, bigotry and xenophobia, which are against true spirituality and true religious values, is no longer news. When Pope Francis gave an account of how building racist walls in and beyond our minds against our neighbours does not reflect Christianity, true spirituality and Godliness, Donald Trump called the Pope disgraceful. But after the outcome of the November 8 election, hate crimes against true Christian values continue to rise in an unprecedented manner in American schools and neighbourhoods. The most recent incidence occurred on Thursday December 1, 2016 in New York when three men harassed 18-year-old Yasmine Seweid, an American Muslim born in Brooklyn. Ms. Seweid is a student in Baruch College, New York City. On the night of December 1, she was waiting for the train on 23rd street New York when three men harassed her. They called her a terrorist, as they shouted Donald Trump’s name. One of them attempted to pull off her Hijab! What is more worrisome is that no one came to her rescue! But unlike Donald Trump’s third wife from Slovenia in Eastern Europe, who violated American immigration law before she became a resident, Ms. Seweid is a natural born American like Donald Trump himself! Ms. Seweid was born in Brooklyn, in the city of New York, yet three men harassed her, and asked that she leave her own country. This plague and blight is what 52 percent American Catholics, and 88 percent American evangelicals who voted for Trump’s commitment to “conservative values” and therefore racism, bigotry, xenophobia, homophobia sexism, anti-Semitism have enabled. This is why it has become a fundamental obligation, a life saving obligation, to protect and defend the bible and people – who are targets of hate, racism and bigotry – because what a section of American Christianity has enabled is against Christianity as found in 1 John 5: 12, 1 John 4: 20, and John 17: 21. While Pope Francis was not speaking specifically about the outcome of American elections when the Pope spoke during a formal ceremony in St. Peter’s Basilica marking the creation of 17 new cardinals, however all true and genuine servants of God like Pope Francis are voices of the people and therefore voices of God, as contained in 1 John 5: 12, 1 John 4: 20, and John 17: 21. Pope Francis warned the world’s Catholic cardinals against a “virus of polarisation and animosity” that he said has seeped into the church, and by extension our society. Pope Francis observed that such attitudes are “contrary to the richness and universality” of the faith community. The Pope told the new 17 Cardinals that we live in a period in which people try to solve problems by excluding others or separating groups of people from one another. 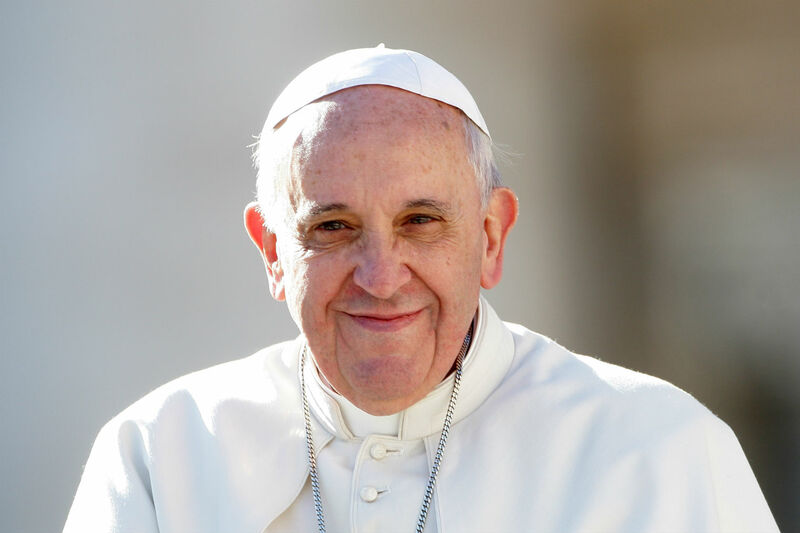 Pope Francis describes himself as a servant of all servants of God. A SERVANT, that is the key word. May the world notice this key word-servant as we all serve him who created us. May the Pope continue to grow in God’s health. May Pope Francis remain divinely blessed in Christ. May he remain blessed as the servant of the one who called him and adopted him. And this is why as we continue the advent in earnest expectation of Christmas, given the vote of a section of the American Church for hate, racism and bigotry in the American election, the critical questions are: where is Christ the prince of unity and love in the Christmas and where are 1 John 5: 12, 1 John 4: 20, and John 17: 21 in Christmas?